CryptoKey is a secure USB flash drive that instantly protects all stored data automatically with hardware encryption and a strong password...CryptoKey is also a device for multi-factor authentication. CryptoKey is a secure USB flash drive that instantly protects all stored data automatically with hardware encryption and a strong password. The CryptoKey hardware controller encrypts all data in real time using AES256-bit encryption in CBC-mode. The data encryption key is generated on board at setup and never leaves the drive. The drive is locked and unlocked by a strong password that is set up by the user but not stored in the drive in any form. It is impossible for anyone to compromise the security of the drive, not even by professional hackers with the brute force attacks. CryptoKey is further protected by an integrated Antivirus and Antimalware engine. Any bit of data copied to the drive is scanned by the Antivirus engine in real time. CryptoKey is also a device for multi-factor authentication. It has two built-in authentication tokens, an OTP token for One Time Password based strong authentication, and a PKI smart token for PKI certificate based authentication. CryptoKey is an ideal device for both strong encryption and strong authentication. The CryptoKey hardware controller automatically encrypts all data copied to the drive using the military strength hardware encryption – AES 256-bit encryption in CBC mode. The encryption is automatic, always-on and transparent to the user. No additional action is required from the user, and the encryption cannot be disabled. The CryptoKey drive has a unlock attempt s counter built into its hardware, which offers the true protection against brute-force attacks. After a number of failures of attempt to unlocking the drive, the drive will be permanently locked down. The CryptoKey drive seamlessly integrates the award-winning Antivirus and Antimalware engine – BitDefender into its on-board firmware. Any bit of data copied to the drive is immediately scanned by the Antivirus and Antimalware engine, preventing the drive from being used to spread malicious programs to unsuspecting host computers. Additionally, a read-only mode prevents virus or malware from jumping onto the device from an infected host PC while the engine is being updates. 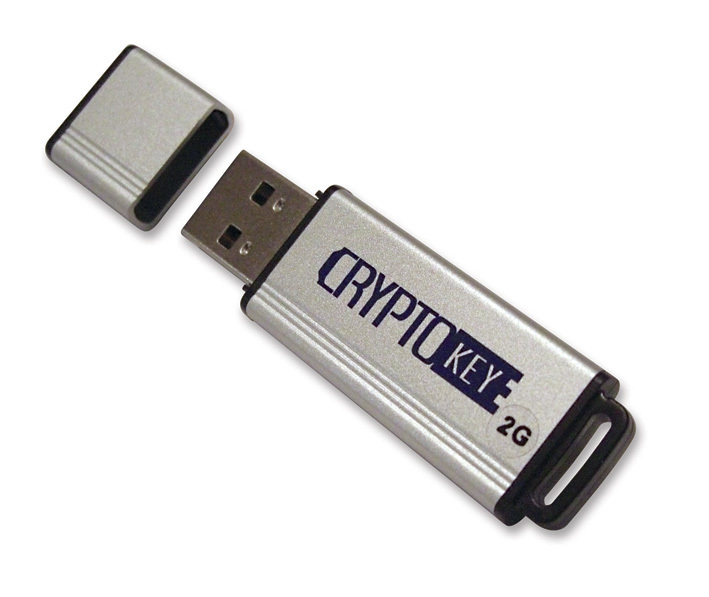 The CryptoKey drive not only offers strong encryption, it also supports strong authentication. Empowered by the Deepnet MobileID technology, CryptoKey is also an One-Time Password (OTP) token device that can be used for strong, multi-factor authentication, eliminating the need for users to carry multiple devices. Many organisations have deployed PKI certificate based applications that require the use of smart cards. With its full public-key encryption capabilities, the CryptoKey device is also a smart card token, which means no additional smart card readers are required when using CryptoKey to authenticate to applications that require client certificates. To ensure that forgotten or misplaced drives do not cause data breaches, the CryptKey drives will automatically lock up its data storage after a period of inactivity. The length of the inactivity timer can be customised by the user. CryptoKey offers policy-based, self-service online password recovery that enables users to recover forgotten password without the assistance of the system administrator or help desk. The self-service portal employs advanced multi-factor and mutual authentication to verify user’s identity. The CryptoKey Management Console is a secure, Web-based service that enables system administrators to centrally manage all users and devices. System administrator can easily initialize the CryptoKey devices, deploy them to end users and audit the activity and status of the devices. In addition, users can use the self-service portal to easily self-provision their devices. The CryptoKey Management Service allows system administrators to easily manage thousands of CryptoKey devices and enforce device-specific policies, including password strength, password retry limits and antivirus policies. With all of those powerful, highly secure features, the CryptoKey drives are yet extremely portable and easy to use. 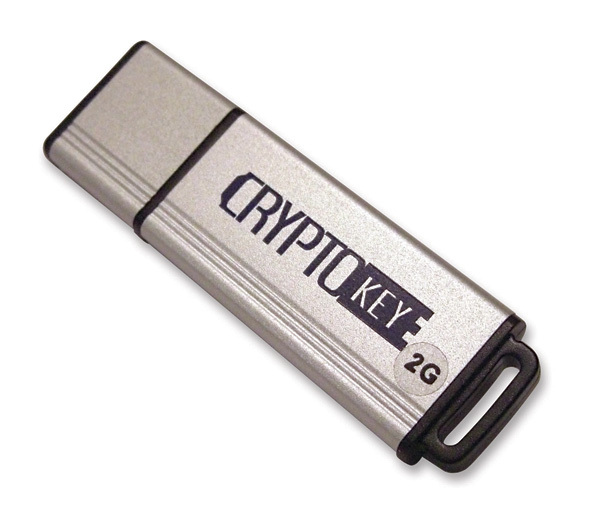 Using the CrytoKey drive is as simple as plugging it in to any computer and entering the user’s password to unlock the device. There is no software to install on the computer and there is no admin right required.